Part of the Society of Women Engineers Mission is to ". 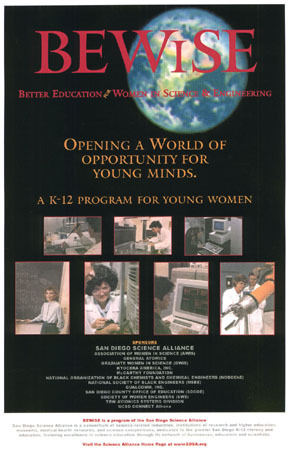 . . encourage young women to pursue careers in engineering and the sciences" and to " inform parents, teachers, counselors, and the community of the opportunities available to women in engineering." to ". . . identify extra-curricula programs that promote science education in San Diego County" and disseminate this information to teachers and students. to conduct workshops in science and engineering for girls.